I received a copy of this book for review from the publisher. This post contains Amazon affiliate links. I really do love these hand-lettered books! I love that they are creative in and of themselves and I also love that they encourage creativity. This one is for letting loose your inner oddball and the topics are pretty fun and what you might expect. The pages encourage writing, coloring, and drawing. If you aren't a great artist like myself, I still think you can use this book (and this kind of book) because really it's for you. Since You're Weird is all about, well, being weird the pages inside encourage the participant to focus on what makes them unique and celebrate it. Some of the topics include thinking about what you do differently than other people, thinking about famous people who are a little different that you admire, picking words that describe you, and reflecting on the events that shaped you into your uniquely wonderfully weird self. Some of the creative activities include drawing an apple that fell really far from the tree and coming up with a slogan for yourself. There are also some challenges of weirdness to complete. The book is delightfully hand-lettered and illustrated. It's cute, spunky, and fun. I think it would make an ideal gift for any young person that might be struggling with accepting their own weirdness or rather uniqueness. It really gives you space to celebrate the things that make you different which is needed and important especially at ages where peer pressure is intense, but really at any age. 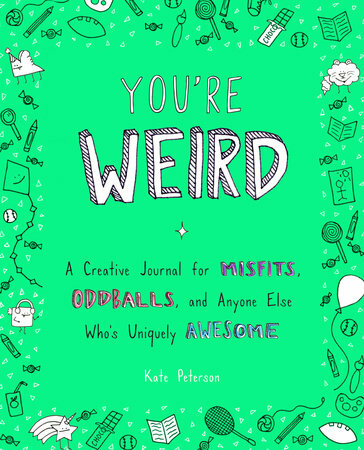 A book like this can be considered a journal and become a respite against difficult times or simply a tool to help you enjoy your unique oddballness even more. I haven't done a Things You Might Want to Know About in ages but I do want to mention the book uses the term "spirit animal" and while I know it's used popularly in the mainstream culture, it has come to my attention that it's cultural appropriation. It's not a term I ever really understood in the pop-culture sense and learning that actually helped make sense of it for me! It's just one page/activity, but it's worth mentioning. If you give this as a gift to your teen you could talk about the use of that word and why other words like patronus are better to use.